Sweet, spicy, savory, hot, mild...how will you describe this dish when you try it? Harira, or Moroccan Lentil Stew, might be described as all of the above. You can vary this recipe to suit your own tastes just by "tweaking" it a little here and there. Make your Harira a little less spicy, less sweet or a little hotter. It's up to you! 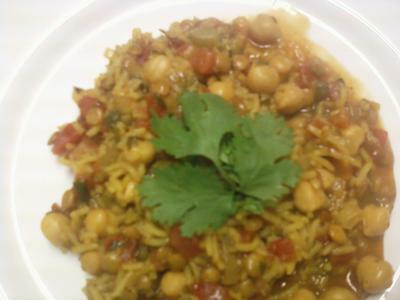 Any way you do it you're sure to love this tasty Moroccan dish submitted by our friend Juli! Heat oil in a large pot until hot, add the onion and cook until tender. Add all the remaining ingredients to the pot. Simmer stirring occasionally 40 minutes, or until lentils and rice are tender. When tender remove from heat and serve.